I’ve been blessed with many opportunities to visit, worship with, & sometimes even guest-lead at other churches. I have worshiped with at least 4 or 5 churches in my life-time that I would truly call “worshiping congregations.” I remember more than one Sunday leading worship where the singing was so loud from the room that I couldn’t hear myself or the band through the monitors! Surely I was leading solo from a piano or acoustic guitar, right? NO! These churches had FULL-BANDS, incredibly technically astute players – many of them touring musicians – big lights, loud music, & AT LEAST 50% of the songs were originals, written in-house, or “in-network”! Of course, some of those nights were special – moments where God showed up in a way that no one could’ve planned for and just did His sovereign work, BUT many more of those moments were just normal church for these people. Those are moments & environments that I long for, but those moments were common for those churches. So I began to ask “Why?” These churches worked at creating a worshiping culture. They taught worship – corporate participation in particular – via every avenue, consistently: Sunday morning service, small-groups/Sunday schools, one-on-one mentoring/discipleship – the spiritual D.N.A. of those churches acknowledge something the Evangelical church to easily forgets. We were MADE to worship! God created us for this purpose, & it is one of the things we will continue to do long into eternity after the “end”. When we’re with Jesus in the afterlife, there’ll be no need for “Solid Biblical Exegesis” – no need for Evangelism where everyone is already “saved” – no need to understand tithing, or how to love your neighbor. But we will sing praise! 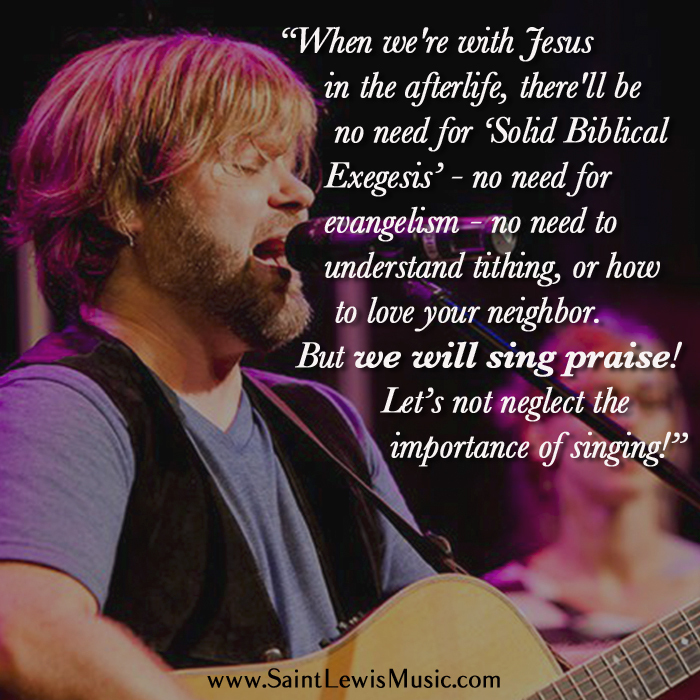 Let’s not neglect the importance of SINGING! The consistent drive to create a worshiping culture ensures that – whether singing hymns, folk songs, or loud, modern rock – the church will give it all during corporate singing. That’s just to say: we need to make TEACHING WORSHIP a greater priority. I understand the problem: lead pastors in particular tend to under-emphasize the eternal importance of corporate singing, in some cases because they may even fear losing their “authority” within their congregation by elevating the importance of the worship pastors’ role. I’ll say this: that hasn’t been the case in the churches I referenced earlier. In fact, the congregations respect & admire the pastors’ own commitment to worship God with all that he has! It inspires greater respect in his people, not less. So, that is my call: where the corporate worship of God is elevated to it’s proper place, people “get it”, & they participate. Where that emphasis is lacking, people will only sing if they like the music, & we’re back in the front row of the “worship wars”, trying to please people’s tastes, & tickle everyone’s fancy. Teach worship, & teach it how the Bible instructs us to teach: explain it, discuss it, lead it, walk it out, & encourage others to do the same. 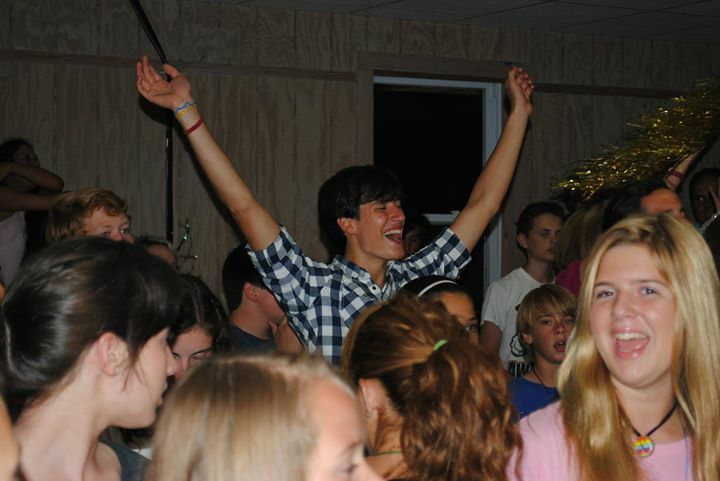 I call it “worship discipleship”. Teach who God is, who we are, why we should sing, and teach us TO SING, & teach that with all that you are, & in all that you do. If you do that, you won’t be able to MAKE them stop singing! Shannon, thanks so much for writing this! I read a few of the blogs you mentioned about why people don’t sing, and I went away feeling so DISCOURAGED because I’m someone who loves modern band music, lights/production, doing new songs AND writing/singing original songs. I think you hit the nail on the head here. It’s not a matter of style loudness or rock stars – it is COMPLETELY a teaching thing in my opinion. Teaching by the pastor from the Word, but also the worship leader learning to engage the people and coach them as well. Thanks so much for writing this! Hey Shannon! Just as there is power in corporate prayer, (IHOP, etc. ), there is so much POWER in corporate worship! When a church body is ONE SPIRIT and locked in agreement during song worship and praise: 1) It takes the focus off the praise team and makes God the purpose of OUR praise. 2) In it’s purest form, praise ushers us into The Holly of Holies and in to God’s presence. 3) There is nothing that satisfies God more than our worship & praise and praise teams are front line warriors that set the tone and atmosphere for The Word to be brought forth with which God’s Holy Spirit is welcomed into our dwelling place and sometimes God changes service to just praise & worship for the entire service because it may delight Him to do so! In summary, a church body that delights God, in His Presence, will be transported to an encounter with Him that can be likened to pure worship without any human intervention. Which words cannot describe, music nor lyrics can transcend! Thus the experience of God’s Glory Cloud, as in the tabernacle experience in Moses’ day!